As you can see from the title, this post is all about... Chocolate and caramel! Cam loves caramel things and he especially loves chocolate and caramel things so when I suggested these cupcakes, he was over the moon! It was the first recipe I made while we're housesitting and it was pretty successful. What I did was to spoon the caramel in the cupcakes before they were cook, but next time I'd wait until they're cooked, scoop out the middle and put the caramel in then. They tasted amazing but unfortunately most of the caramel sunk to the bottom. Who knew caramel was heavier than cupcake? It's a really easy caramel too, because I haven't really made caramel that much and I'm not really confident with it, but this one was dead easy. Enjoy! Preheat oven to 180°C. Line muffin pan with paper liners. Whisk together the milk, sugar, oil, and vanilla extract and beat till foamy. In a separate bowl, sift together the flour, cocoa powder, baking soda, baking powder, and salt. Add to wet ingredients and beat until no lumps remain (or very few remain). Pour into liners, filling each with 1/4 cup of batter. Bake 18-22 minutes, or until a skewer inserted into the center comes out clean. Transfer to a cooling rack and let cool completely. Once cooled, cut out cones from the tops of the cupcakes with a small knife, approximately 3cm in diameter. Cut off most the bottom, leaving just enough to replace the top. (see: Cinnamon Chocolate Churro Cupcakes) Spoon a heaping teaspoon of filling into each cupcake. Replace the top and press into place. 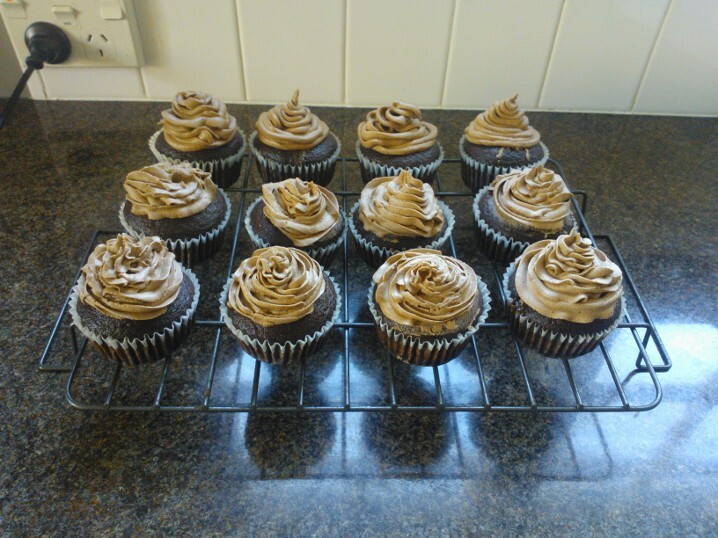 Ice the cupcakes with the chocolate caramel icing to cover up the marks! Place sugar, condensed milk and butter in a medium saucepan and heat. Take off heat when bubbling (careful not to burn!) and add icing sugar and hot water. For icing, cream butter until smooth and fluffy, 2-3 minutes. Add cocoa powder and beat until incorporated. Add 1 tablespoon soymilk and mix to combine. Add confectioners' sugar 1/2 cup at a time and mix until light and fluffy, 3-5 minutes total. Add caramel filling and mix well. If frosting is too thick, add more soymilk and beat until fluffy. If frosting is too soft, add more sugar and again, beat until fluffy. You want the frosting to keep it's shape when piped on to the cupcake, but still fluffy enough that it stays light and soft when eaten.